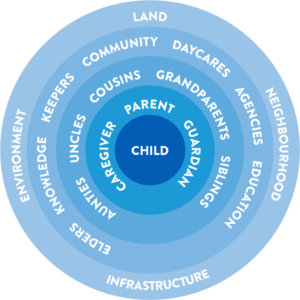 The Child Centred Model was documented during the first year of the project with the help of community leaders, knowledge keepers, and the Point Douglas neighbourhood. We believe that if the CCM was implemented across all systems, we would see a dramatic shift in outcomes for our children and families. The model was developed through a deep dive into the vast knowledge base of local residents – a community that best knows how to define success for their children and what they need to achieve it. The model provides specific guidance on how we can all support a child’s healthy development in this community. Anyone whose work affects their community should seek to understand and respect this wisdom. The model prioritizes developing meaningful relationships and acknowledges community members as the experts in their lives. 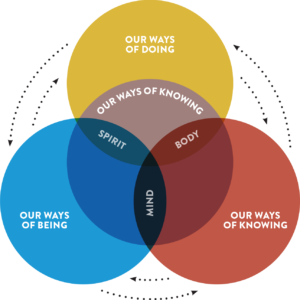 This way of working is the foundation of the calls to action from the Truth and Reconciliation Commission of Canada. The foundation of the model is interconnectedness, in the sense that you cannot change one aspect of a child’s life without also affecting all the other parts of their life. The body, mind, and spirit are interconnected parts of a whole person. Likewise, systems, communities, and people are interconnected and interdependent. Work toward supporting the whole person, not only specific parts of their life. Focusing on strengths gives people energy to grow; regardless of an individual or group’s situation in life, they have strengths. Value and nurture these strengths. access to basic needs for all. When people are supported by others they gain the strength to return that love and support. Foster this interdependence. Provide opportunities for self-determination. Allowing individuals to make choices to attend to their needs will lead to them being able to support family and community. Encourage self-determination. It is all of our responsibilities to support success for children. Support not only the child, but the whole community, history, and culture around them.